This is the base of our body butter with ingredients added that have analgesic properties. Customers report sucsess in relieving arthritic and muscular pain with this non greasy cream. Water, Caprylic/Capric Triglyceride, Cetearyl Alcohol and Peg-20 Stearate, Glyceryl Monostearate, Glycerine, Dimethicone, Shea Butter, Octyldodecanol, Jojoba Oil, Cocoa Buter, Sodium PCA, Imidazolidinyl Urea, Sodium Benzoate Chloraetamide, FD & C Blue No. 1, D&C Red No. 33, Menthol, Benzoin Tincture, Essential Oils of Lavender, Wintergreen, Lemongrass, Patoulli & Eucalyptus, No Petrochemical Ingredients. 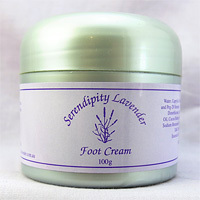 A rich non greasy cream which may be used on the hands,face and body. 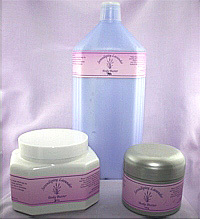 Its ingredients include shea and cocoa butter,vegetable glycerine and jojoba oil. Water, Caprylic/Capric Triglyceride, Cetearyl Alcohol and Peg-20 Stearate, Glyceryl Monostearate, Glycerine, Dimethicone, Shea Butter, Octyldodecanol, Jojoba Oil, Cocoa Buter, Sodium PCA, Imidazolidinyl Urea, Sodium Benzoate Chloraetamide, FD & C Blue No. 1, D&C Red No. 33, Lavender Essential Oil. Our most popular product. 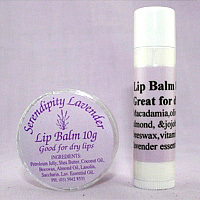 It is top quality with a superb fragrance and a soft smooth non greasy consistency. It may be used on the hands,face and body.Many customers with skin problems such as eczema and dermatitis report success in using it to relieve their conditions. Other customers have told us that it’s the only cream they have ever been able to use. Water, Mineral Oil, Glyceryl Monostearate, Cetyl Alcohol, Stearic Acid, Propylene Glycol, Dimethicone, Triethanolmine, Lanolin, Alcohol, Fragrance, Carbomer 934, Imidazolidinyl Urea, Methyl Paraben, Tetrasodium EDTA, Wheatgerm Oil (Natural Vitamin E), Evening Primrose Oil, Jojoba Oil, Lavender Essential Oil. 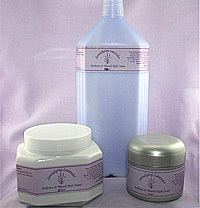 A gentle lotion for face, hands and body. 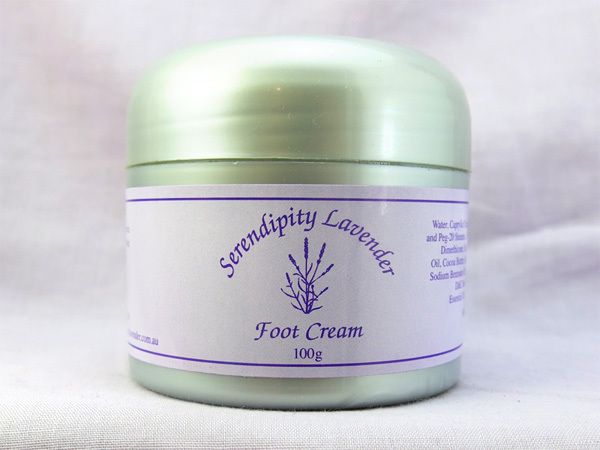 It is lighter than the moisturiser but with a stronger lavender scent. Water, Refined Mineral Oil, Glyceryl Monostearate, Cetyl Alcohol, Glycerine, Sorbitol, Jojoba Oil, Propylene Glycol, Stearic Acid, Silicone Fluid, Triethanolamine, Sodium PCA, Octyl Methoxy Cinnamate, Tetrasodium EDTA, Methyl Paraben, Imidazolidinyl Urea, Lavender Essential Oil. Our body butter base with lavender and peppermint essential oils. Ideal for sore and aching feet. For maxium relief use the bath salts and foot soak first. Petroleum Jelly, Shea Butter, Coconut Oil, Beeswax, Almond Oil, Lanolin, Saccharin, Lav. Essential Oil. 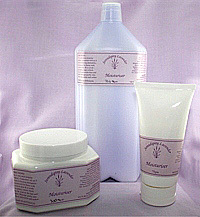 Macadamia, olive, sweet almond & jojoba oils, beeswax, Vitamin E & lavender essential oil. 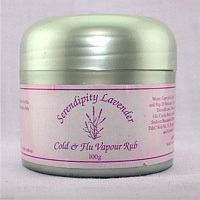 To ease the minor symptoms of colds and flu, rub on chest, back and a little under the nose. Water, Caprylic/Capric Triglyceride, Cetearyl Alcohol and Peg-20 Stearate, Glyceryl Monostearate, Glycerine, Dimethicone, Shea Butter, Octyldodecanol, Jojoba Oil, Cocoa Buter, Sodium PCA, Imidazolidinyl Urea, Sodium Benzoate Chloraetamide, FD & C Blue No. 1, D&C Red No. 33, Essential oils of Tea Tree, Eucalyptus and Lavender. No Petrochemical Ingredients.